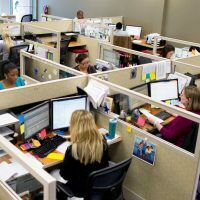 I used to work at a very large engineering firm that had the “cube farm” open plan office setup (which I referenced in a previous blog). The cubicles were arranged in work groups, and the groups were arranged by clients and market segments. From my desk, the groups to my right and left engineered for a specific client, and the groups in front of and behind me engineered similar products. This open plan office layout scheme made it very easy for the engineers to identify strengths, as well as figure out boundaries, based on the privacy needs each client requested. The ambient noise on the floor was quite low and confidential privacy was difficult to achieve. There was a general din from all the activity, but each of the adjoining groups could pretty clearly hear the other and our work at hand was the only thing that really helped to avoid distraction. Every morning, without fail, an engineer in an adjoining group would begin to sneeze. Her sneezing was allergy driven and would continue sporadically for several minutes as her body adjusted to the air in the building. A person sneezing, even several times, isn’t too big of a distraction; however, in this particular case, the sneezer let loose in perfect cartoon fashion – complete with the ah-ah-ah buildup and the high pitch squeak finale. With each sneeze you’d hear someone from an adjoining group announce “Bless you!” in response. With every new sneeze, a different “Bless you!” would be announced from different groups. Four or five sneezes later, everyone joined in a group laugh. I never actually found out who the sneezer was, and it was local folklore in the surrounding groups. While my old work group’s morning ritual probably benefited morale more than it hurt productivity, there were other sporadic noise sources on the floor that did grossly affect our productivity. Work group layouts were under construction as frequently as a Chicago highway, complete with road closures and foot traffic detours. Intrusion from outside voices that were unfamiliar also often piqued curiosity and would pull us away from our desks. Any new noises resulted in everyone poking their heads above their partitions in perfect prairie dog fashion. Just as Mandy Kachur noted in her August 13 blog, transient noise really does grab attention. Acoustical consultants can’t remove all of the transient noise in a space, and it does help define the overall experience of the work groups. However, we do have tools that can help to reduce the amount of employee distraction. Well thought out layouts, furniture selection, room acoustic treatments, and sound masking systems all work together to provide a comfortable acoustical environment that strengthens the worker’s experience resulting in improved performance and productivity. A qualified acoustical consultant will work tirelessly to ensure the inside jokes and camaraderie remain and the disruptive distractions are minimized.